The CR Clarke CR25 machine is ideal for both education and small-batch industrial production, providing a clear demonstration of injection molding principles while producing high quality moldings. A mold is fitted into the adjustable vice in the lower section of the machine. Material to be injected is loaded into the hopper at the top of the temperature controlled heating barrel. Once heated, the material is injected into the mold cavity by rotating the capstan handle. The injected material is allowed to cool, and then the vice is opened. An integrated stripper plate allows moldings to be released automatically should the mold be fitted with suitable ejector pins. The completed molding is immediately ready for use. The machine can be used both for single pieces and for continuous manufacturing. 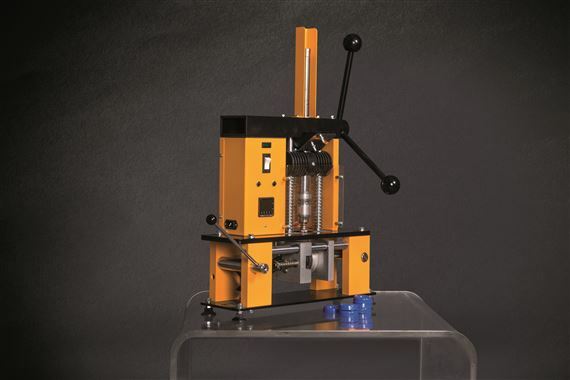 The CR25 Injection Molder will process many common thermoplastic materials including Polystyrene, LDPE, HDPE, Polypropylene and Nylon, and comes complete with a mold for a contoured wheel. Other molds are available as follows: Wheel, Paperclip, Golf Tee and Tool Handle (Screwdriver). Blanks are also available to allowing the user to create their own mold designs.